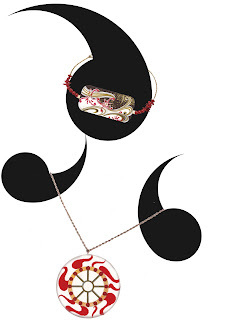 In this piece I designed a necklace and bracelet from the Higanbana motive in my previous pieces under the same theme. The bracelet uses a tradition golden laquer pattern. The necklace uses a pattern inspired by a "dragonfly ball" or traditional Japanese glass marble. The red pattern in the ball is inspired from coral.